The Rose Room opened in 2012 as a modern facility for use by local businesses. Users of the room are able to choose from a variety of seating configurations to suit their meeting style, as the boardroom table is modular. In traditional boardroom style the room sits 16 in comfort, while for educational sessions or presentations the theatre layout will sit 30. 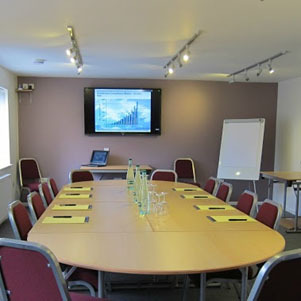 The room is fitted with a 60” LCD display screen and wi-fi. Flip chart, whiteboard and markers are available at no extra cost. There is a kitchen with all the equipment required for catering, or local catering partners can provide high quality, flexible catering options to ensure meetings run smoothly.